Courtesy of the Chattahoochee Nature Center. What: Enjoy this sweet tale of what happens when the apple falls very far from the tree. Based on Hans Christian Anderson’s The Ugly Duckling, and performed by Théâtre de Deux Mains of Montreal. What: The National Parks Service celebrates 100 years in 2016, and this IMAX film—narrated by Robert Redford—lets you experience the beauty of their caves, canyons, wetlands, mountains, and more. What: See artist Dapper Bruce LaFitte’s meticulously detailed drawings of New Orleans school marching bands. What: Fernbank’s hands-on exhibition explores sound and music in nature. Hear the sounds of whales and underwater earthquakes; compose and play your own song; learn more about how birds communicate; and more. What: Bring a blanket for the free family concert and movie series, which kicks off on May 28th with Minions. Films begin at dusk, but show up early for live bands and bouncy houses. Food and drink will be available for purchase, too. For more outdoor movies, check out Candler Park’s Flick-Nic, Duluth’s Flicks on the Bricks, Mableton’s Movies at the Mable, and Atlantic Station’s Movies in Central Park. What: See the world premiere play based on Eric Carle’s kid-favorite picture book, then head across the piazza to check out the High Museum’s exhibition of Carle’s original hand-painted collages. What: See this adaptation of E.B. White’s classic children’s book in Serenbe’s picturesque farm, surrounded by live animals. Cost: $12; $8 for kids ages 3 to 13; free for kids 2 and under. Adults must be accompanied by a child. What: Japanese art collective teamLab brings this 3,7000-square-foot interactive art exhibit—which they describe as a “digital playground”—to the Mall of Georgia. The seven hands-on works include Sketch Aquarium (explore a virtual underwater world); Sketchtown Papercraft (turn crayon drawings into 3D paper sculptures); and Light Ball Orchestra (create a sound and light show by touching beach ball-sized globes). What: True, $30 ain’t cheap, but this special arts festival for children up to age 5 offers a lot of bang for your buck. Come for infant and toddler tours of the High, art-making and yoga classes, Eric Carle story times, kid-friendly theater and music performances, and more. What: This traditional Indian festival has roots dating back nearly 2,000 years. Watch as a huge, ornate chariot—flanked by musicians and dancers—is pulled by ropes over 100 feet long from Woodruff Park to Centennial Olympic Park. What: Cheer as kids go flying in homemade racers, in hopes of competing at the world championships in Akron, Ohio, in July. What: Get to John Howell Park early (around 9:15 a.m.) on Saturday for the Tot Trot race for children under age 7, then head over to the western edge of the park for crafts and games at the KidsFest. There will also be two music stages (find a handful of young performers, including Burke Connolly Academy Irish Dancers, at the acoustic stage), an artist market, and plenty of eats. 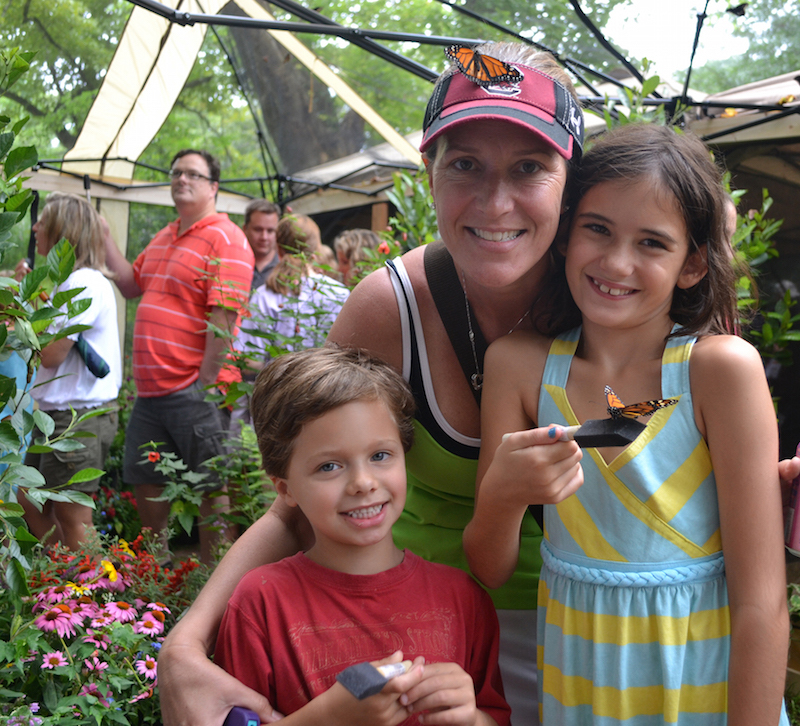 What: Watch as hundreds of butterflies are released into the air, then grab a nectar stick and see if you can lure a painted lady inside the (admittedly sweltering) butterfly tent. Afterward, cool off with a treat from King of Pops. What: Stop by for crafts, games, stories, and other activities alongside former Atlanta mayor Shirley Franklin, whose vision helped shape the Center for Civil and Human Rights. What: This summer’s series kicks off with Hansel and Gretel and ends with Jack and the Beanstalk, with a new show beginning each week. What: Finally, a play that appeals to your Jake & the Neverland Pirates fan and your Ariel fan. An adventurous mermaid princess hops aboard a pirate ship in this production for ages 4 and up. What: Life moves pretty fast. So take a moment to stop, look around, and introduce your kids to the never-gets-old John Hughes classic at this screening, part of the 2016 Coca Cola Film Series. What: Want to show your kid how much fun it was to grow up in the 1980s? Old-school game enthusiasts can check out more than 250 arcade, pinball, and console machines, take part in a pinball or video game tournament, screen cult films like The Last Starfighter—and meet its star, Lance Guest. What: Learn about life below the surface and how we can help protect the Earth’s oceans with a day of special activities and fun. Party with turtles and sea lions, play recycling and sustainable fishing games, pop in to the family photo booth, and more. When: Noon to 8 p.m.
What: Okay, so it’s technically taking place one week before the longest day of the year. But you can still get into the summer spirit at this neighborhood festival featuring a barbecue grill-off (attendees must purchase tasting “passports” to sample the food), artists market, live DJs, and pet costume parade. When: 11 a.m. to 4:30 p.m.
What: See a performance from the Atlanta Chinese Dance Company, make your own floating dragon boat, and participate in a Chinese fan dance. What: Some of our favorite highlights of this weeklong celebration: kids bike-riding clinics; a doughnut-fueled ride between Revolution in Decatur and Sublime in midtown; an after-dark “Moon Ride”; and a spin down the Silver Comet Trail followed by an overnight camp-out. When: 4 p.m. to 8 p.m.
What: A 2.7-mile stretch of intown artery Peachtree Street closes to traffic from Edgewood Avenue to 17th street. Show up at 4 p.m. for the bicycle parade—sure to be impressive during the middle of the weeklong Atlanta Cycling Festival. What: Inspired by the movie Avatar, this Cirque du Soleil show imagines what life was like on planet Pandora thousands of years before the film takes place. When: 5 p.m. to 11 p.m.
What: Sixty tons of trucked-in sand transform Ponce de Leon into a veritable shoreline. Adding to the entertainment: A kids boardwalk, live music, a DJ-led dance party, funnel cakes and umbrella drinks, and a Ninja climbing wall for attendees ages 13 and up. When: 4:30 p.m. and 7 p.m.
What: That’ll do, pig. The Center for Puppetry Arts screens the beloved 1993 talking animal adventure; tickets include admission to the Worlds of Puppetry Museum. What: Sandy Springs hops onto the lantern parade bandwagon with this inaugural walk to Morgan Falls Park. Themed “Take It To the River,” the parade will feature a floating alligator lantern gliding down the Chattahoochee. What: Last year marked the 150th anniversary of this holiday commemorating the end of slavery. The parade, which honors African American history and culture in the Southeast, runs from Mozley Park to the campus of Morris Brown College. What: In addition to the parade (above), the History Center hosts two days of museum activities, immersive theater performances, and crafts around the themes of freedom and family history. What: Superhero capes and tights are de rigueur for a day of crafts and activities, plus a costume contest and live DJ. Admission is free for dads and other uniformed “community heroes” (fire fighters, police officers, EMTs, and military personnel). When: 10:30 a.m. to 8 p.m.
What: Spend Father’s Day at Stone Mountain among 1950s-era Mustangs, Camaros, Chevys, and other classic roadsters. What: Adapted for the stage from the MGM film, this production includes your favorite songs from the Oscar-winning musical, plus new tunes by Tim Rice and Andrew Lloyd Webber. What: It’s baaaaaaaack. The 1,000-foot mega waterslide, which came to Decatur last September, hits downtown’s Centennial Park. BYO float. What: See Huck, Jim, and Tom Sawyer on stage in this production of the Tony-winning musical based on Mark Twain’s Adventures of Huckleberry Finn.